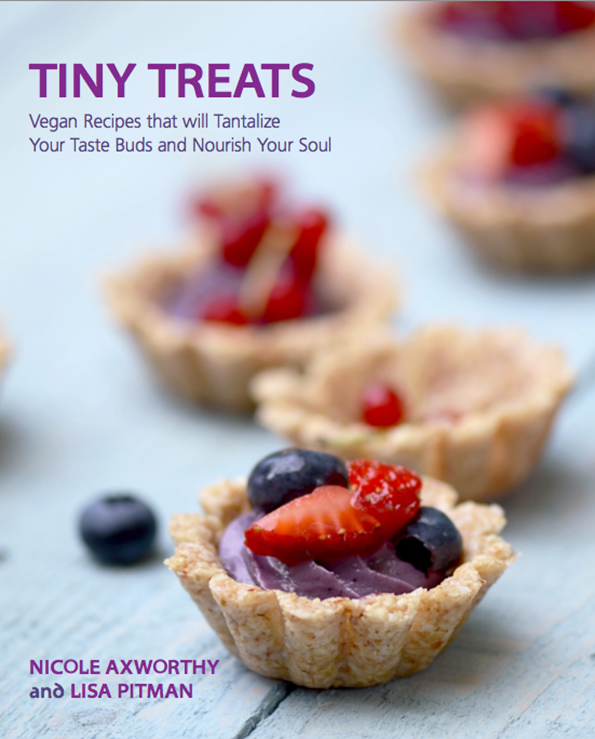 Recently, Lisa from Vegan Culinary Crusade and Nicole from A Dash of Compassion launched Tiny Treats – an e-cookbook devoted to 25 recipes free of wheat, soy, eggs, dairy, and refined flour/sugar. Needless to say, I was excited to check it out when Lisa offered to send me a copy. The recipes are unique, healthy, and elegant all at the same time, not to mention the photography and page layouts could be straight out of a food magazine. You can really tell how much time and love went into creating this book! The best part, aside from the wholesome desserts, is that Lisa and Nicole are donating a third of all ebook proceeds to the Elephant Nature Park in Northern Thailand. You can read all about Lisa’s volunteer efforts at the Elephant Nature Park on her blog here and here. If you wish, help support their mission by purchasing an ebook here. 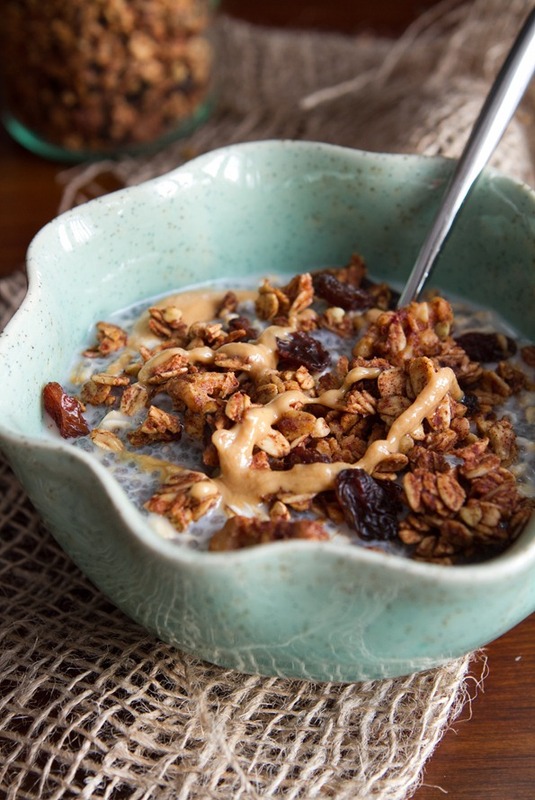 Lisa and Nicole generously allowed me to share a teaser recipe from the ebook today – Cinnamon Bun Granola! You know, the smell that has tortured people in shopping malls everywhere for years? I sure do. Well, now that smell can be found in your own house! A big, gooey cinnamon bun….in granola form. Shared with permission by Lisa Pitman and Nicole Axworthy. Tiny Treats Ebook. Copyright 2012. From Lisa and Nicole: If we ever open a vegan B&B, this will be on each breakfast-in-bed tray. We would keep the guestrooms full by serving it up differently each day–in a layered parfait glass with sliced apples and almond yogurt, or on top of our favourite banana soft serve, or in special tea cup with a substantial splash of coconut milk. The options are endless. Email, text, or print this recipe. 1. In a large bowl, stir together the oats, buckwheat, walnuts, shredded coconut, raisins, cinnamon, salt and nutmeg. 2. Using a blender, blend the maple syrup, dates, coconut oil, water and vanilla extract into a smooth, thick sauce. 3. Pour the sauce into the bowl with the dry ingredients and stir until all the dry ingredients are well coated. 4. 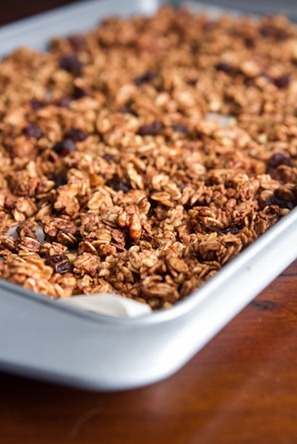 Transfer the granola to a Teﬂex-lined dehydrator tray and spread into a thin (about 1/2 inch thick), even layer. Dehydrate for 8 to 10 hours at 115F. 4. Preheat the oven to 300F. Transfer the mixture to a baking tray lined with parchment paper and spread into a thin, even layer. Bake for 25 minutes, gently stirring every 10 minutes to ensure even browning. Allow to cool completely before gently breaking into clusters. Store in an air-tight container in the fridge or at room temperature. Makes about 6 cups of granola. I made this granola in the oven and it turned out lovely. Next time, I will have to try it in my dehydrator…if I can wait that long! If you’d like to purchase your own copy of Tiny Treats, you can do so here for $9.99. Big thanks to Lisa and Nicole for allowing me to share this amazing recipe with you all today! I’ve been working on a bunch of treats to share with you this month, so stay tuned for some delicious, spooky fun! If you have a Halloween treat you’d like healthy-ween-ized (just go with it), let me know in the comments below. I’ll try to pick a couple to add to my list. Just please don’t ask me to make a cat litter cake (Sketchie doesn’t want one either). WOW this would be incredible as a granola bar too! Can you make healthy caramel apple CHIPS!? Amazing!! Can’t wait to try it. This fall I’ve enjoyed making your Apple Butter and Pumpkin butter. Mmm.. Healthy cinnabon! Hi! I absolutely love your website! I relatively recently started transitioning to a vegan lifestyle and your recipes have been such a help! I was wondering, is there a substitute for coconut oil in the granola recipe? Im allergic! Hey Katherine, Thanks for your kind words! You could probably sub the coconut oil for a light tasting oil, such as grapeseed. I can’t wait to see what treats you will be sharing with us! 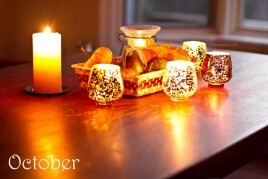 I *love* how Pumpkin/Fall oriented your blog has been lately! This looks really good, think I’m gonna try it next week! You know, I’m nervous about the buckwheat groats… I’ve tried making your smoothie recipe and for whatever reason, I can’t get away from the slime factor once liquid is introduced… Can you speak to that? Maybe do a tutorial? Or is it just me – I’ll have to get over it? Which smoothie recipe do you mean? The Raw Buckwheat Porridge – the picture I want to eat right off the screen… :-) I’ve made it twice, and just seem to be unable to rinse the buckwheat enough… Thanks for your insight! You could add “cinnamon roll” to any recipe and I’d have a Pavlovian response. Cinnamon Roll Liverwurst. Yum. Or maybe that was taking it too far… LOL! Oh my yum!! I love cinnamon anything, so this is a must-try! Have you ever tried pumkin & olive oil granola? This is my go to. Honestly, the BEST!! Oh wow. I think I’m going to get up from the computer this second to make this. One question — most granola recipes say to add the dried fruit after baking — but you add it before, in this case? good question – I added the raisins *after* baking because that’s usually how I do it too. I will add that into my post. Yum, this granola looks fabulous! I’m doing a couple of spooky Halloween treats on my blog too! Next week: Monster eyes… haha I just love Halloween. I was going to start on the recipes this morning until I realized that the baking temperature in my new oven isn’t right… sooo gotta deal with that before I make the eye balls. Mmmm cinnamon! I love anything cinnamon so I am sure this is delicious! Perfect for fall. Thank you so much for sharing the ebook love! I’m so happy you enjoyed the granola and wanted to share it with others. That Cinnabon smell is so addictive! Thank you for sharing Nicole! I’m sure it will be enjoyed by many. I hope you raise a ton of money for the elephants! Keep me posted. That cookbook will be going on my wishlist! I am always drawn in by Cinnabon, why are they sooo good?! I have actually been to the Elephant Nature Park in Thailand and can honestly say that its such an amazing place!! The amount of time that the volunteers and staff dedicate to the elephants that have suffered is truly inspiring! Such a great idea for donations – I will be purchasing the e-book for sure! I can imagine that would’ve been a great experience! 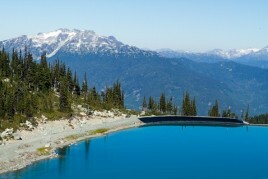 I would love to go there some day. Thanks for supporting the book! Oh my! It looks so delicious! And I love the smell of cinnamon – it makes me think about december and christmas :) I will definitey make this granola when I have finished the rest of the granola I already have in the house. I have a confession: I am enamored with Medjool dates and want to add them all my sweets! But I need protein with them, and c’mon, let’s be honest, dried dates look kinda spooky! 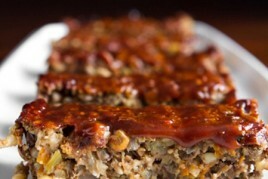 If you can muster some creativity juices with dates and a protein, I would be ecstatic! Seriously. An Ang-verson of goat cheese stuffed dates would be a GREAT fingerfood for my autumnal festival! I’m looooving and sharing with non-vegs my raw brownies, so I’ve got that one down. But always on the lookout for baby Oh She Glows recipes to add to my repertoire! :) Thanks, girl! Can’t wait to see how you bring it to life! With such gorgeous photography, even an icky “cockroach” will look ah-mazing! I know you commented on this a while ago, but I just tried dates for the first time and, after absolutely loving them, was looking for a protein pairing for snacks. I’ve found that stuffing pitted dates with nut butter – especially peanut butter – is quite divine! i love that you’re doing this. My oldest daughter is a Halloween baby. It’s an important holiday in our house! Can you maybe come up with something spectacular and healthy I can send in her lunch that day? She’s an awesome healthy eater and LOVES pumpkin. I’m sooooo looking forward to your upcoming recipes. Okay, describing the granola as “cinnabon” totally got my attention. Yum! The granola looks super yummy, I will definitely have to give it a try! Can’t wait to see what you’ve got cooked up for healthy treats! I’m excited about the treats. Woohoo! I love the Tiny Treats recipe book! Lisa and Nicole did a fabulous presentation at the Vegetarian Food Fair last month, I learned so much! Looking forward to your Healthyween treats! I have that bowl! I use it all the time in pics. Just used it in my post on Wednesday! I have it in cream and teal and wish it came in more colors – so versatile. And this granola, Angela, it sounds delish! Cinn buns are the best…and worked into homemade granola, even better! Um, Butterfingers? Healthy Butterfingers? Yeah, that’s my request. This granola looks amazing! Sometimes I wish I lived someplace less remote so I could more easily get hold of the ingredients to make all of these delicious-sounding recipes. Treat-a-thon? Count me in! :) I do have a request: My favorite sweet this time of year has always been candy corn. I could literally stuff my face with an entire bag in one sitting! The problem is, most of the stuff has gelatine, and the brands that don’t? Artificial sugars and tons of synthetic ingredients/coloring! Can you make a healthy version of candy corn? Is that even possible? Or at least something with a candy corn-esque flavor? I used to be obsessed with candy corn!!! It was my all time fav treat around Halloween, so it appears we are kindred spirits hah. I’ve seen recipes on the web that use corn syrup, but I wonder if it can be made with something else….hmmm. What an awesome collaboration! And how genius to make ‘cinnabon granola’… I can only imagine how addictive it must be! This sounds delicious! Thank you for sharing! Would you know how many calories it has per serving? Thank you very much. I’m sorry I don’t know the nutritional info. You can try using Nutrition data or Calorie count – those are the websites I use when I calculate a recipe and they work fairly well. This looked and sounded so delicious, that I’m literally baking it now as I comment. And you are right…the whole house smells like a cinnamon bun!! So yummy :) Thanks, looking forward to some healthy, fun treat recipes! you could probably just add more oats, or rice crisp cereal, more nuts, sunflower seed, etc. Enjoy! What a lovely recipe! I could eat this every day! I’ve made two batches of the apple butter so far. The first was still somewhat apple-saucy, but the second batch was perfect, velvet buttery apple butter. I actually topped this granola with the apple butter today. Good stuff! Ok, I know this is going to sound disgusting but I’m intrigued with a healthy candy corn type treat. Teehee, probably impossible!!! Can’t wait to make this granola! For Halloween I would love to make caramel apple bites (like a traditional caramel apple but sliced before dipped in caramel for extra caramel-ness and less mess). Y-U-M! I can’t keep granola in my house because all I do is eat my face off but I love it so much! What a clever idea!!! My two favorite fall treats are caramel apples and apple cider donuts. Caramel is usually made with a milk base, isn’t it? Can you make a vegan caramel apple? This sounds amazing! Should I soak the dates before using them? Hey Becky, It’s your call. I think I forgot to put the dates in all together come to think of it. I did stir in the raisins after baking though (as I find they can puff up in the oven). If your dates are super firm you might want to soften them a bit first. Enjoy! Angela! I LOVE your site! I am on it for hours at a time! I rave about it to everyone! My favorite the last month is the apple pie oatmeal! I eat it everyday! My girls call it apple pie! 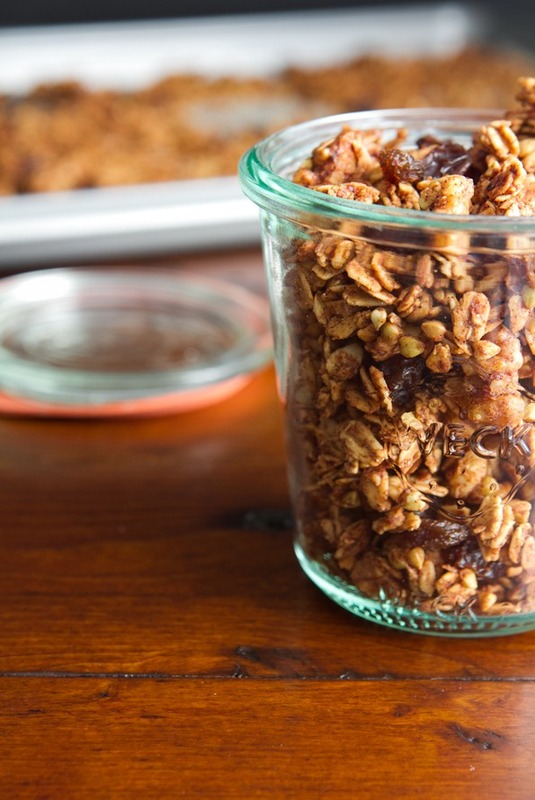 The following recipe for the granola sounds wonderful! Although, I’m wondering how hard the Buckwheat grouts are. I have used them in making bread, yet I cook them first. Are they really hard on the teeth? I just haven’t ever tried them raw before. Keep up the amazing dedication to your work! I would be LOST without it! Thank you Connie! That means so much to me. The buckwheat groats are actually soften than you’d think (at least they were for me). I think you’ll be pleasantly surprised. They aren’t nearly as hard, as say, raw millet. I hope you enjoy them! Oooooh! I’m SO excited for the healthy halloween treats!! And this granola is fabulous!!!! And yay to supporting the Elephant sanctuary! From first hand experience, I can attest that it is a worthy cause. My favorite Halloween dish (and it’s only “Halloween”-ish because my neighbors serve it at their party every year) is this terribly unhealthy cheese dip. I know you’ve done some work with cheese dips made from nooch, but I would love to see a slightly, spicy, healthy “cheeze” type dip. Oh my goodness, Cinnabon! I can’t say I ever enjoyed taking the subway in Toronto, but smelling the Cinnabon stands wafting as I walked down the stairs always made the experience a little more bearable. This sounds delish Ange! And just to let you know, I praised you and posted an adapted version of your pecan pie crust on my blog today!! You are such an inspiration to many dishes in my kitchen. Thank you, Angela!! Thanks for the mention, I will check it out! Thank you for sharing! I especially love hearing other peoples stories about volunteering at the Elephant Nature Park! It was by far the best experience of my life so far!!! Thank you so much for posting about Tiny Treats. It really was a labour of love for us – to read about so many people enjoying what we have created fills my heart with joy. My pleasure Lisa! Thanks for everything you do! I have been looking for a good Granola recipe this week! This couldn’t have come at a more perfect time. – I’m trying it out tonight. Thanks so much to Lisa and Nicole for allowing this to be published! I have a whole wheat yeast free one going in the book, but if it doesnt I will post it here for sure! Yes!! Another grawnola recipe to add to the bunch!! I can tell from the ingredients that this particular one is a keeper! Thanks so much for sharing :] Healthy Halloween treats?! Can’t wait to see what you come up with :P I always looooved anything chewy, like Tootsie Rolls or Sour Patch Kids..and anything made with chocolate too, of course! Oh my gosh, yum! I am definitely making this! I’m tempted to make it right now, but I already have 5 boxes of granola in my cupboard that I need to eat my way through haha. I’m kind of a granola addict! I am in love………with your website Angela! Love it 1000 times. I recently started my transition and accidently look at Oh she glows and it was love at first sight <3. Your recepies are helping me a lot with ideas what and how to cook. I am enjoying my new way of eating and being healty and I can't wait for your cook book and I hope I will be able to buy it here in Australia. Hi Sandy, Thank you for reading! So happy that you enjoy the blog so much. That warms my heart! Wow this granola looks delish! I’m gonna try it without the buckwheat groats since I don’t have them on hand, but I’ll pick them up next time I’m out. I think I will be making this granola very soon! Looks sooo good! Every October I make chocolate mummy cookies to share. They are made using a gingerbread man cookie cutter and then you drizzle white chocolate to make them look like mummies with mini M&M eyes. They are super cute! But it would be nice to make a healthy version without a cup of butter and a cup of icing sugar per ~20 cookies!! I made this last night and didn’t have walnuts, so i subbed in pecans and it is to die for!! 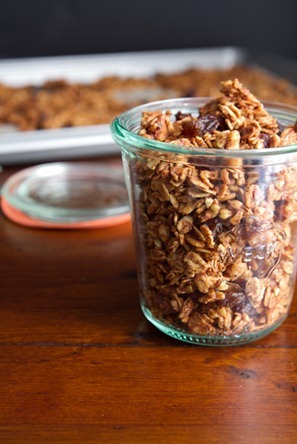 So excited to make this granola – this is going to be a MUCH cheaper cereal option for us! Any substitution for the buckwheat groats? I have every ingredient on hand but those and have pushed the specialty foods budget lately! Can it be omitted? Please tell me the zephyr monster cookies is going to be in the treat-a-thon. I am so looking forward to that recipe! This looks so wonderful! I might have to make a trip to the market in the morning so I can make it! Thanks for sharing! I´m from Germany and I love your blog. Been following for a while now. Ther was always something about making granola that intimidate me but made this one today and i must say yummy, yummy, yummy!! And so easy!! And after a 2h walk the flat has still the warm smell of cinabons :-)!! Can´t wait for your halloween treats!! Making this now added cashew butter! What a great cause to donate to. Cookbook looks interesting, yummy. Home made granola has been on my ‘to make’ list far too long… the shame. What about a pumpkin version of the cookie dough blizzard? Maybe the cookie dough could be a pumpkin cookie variety? Or possibly the banana soft-serve could be the pumpkin/spice portion? A good pumpkin cookie is always my favorite treat this time of year! Thanks for the granola recipe, looks amazing! Just made this today…served with diced pears slightly warmed and a splash of coconut milk… by far the yummiest feel good comfort food!!!! Please tell me that the Zephyr monster cookies are going to be included in the treat-a-thon… I love the cookies and have been anxiously awaiting their arrival as a recipe! This looks delish!! Can’t wait to try it out. For Hallowe’en treats I would love to find a healthier vegan version of hallowe’en kisses. Do you remember those?? You had to eat them the same night or else they’d be rock hard by the time you got around to them…or so I would tell myself! I make these cookies (see address below) every year for Halloween but I’m hoping to make them a bit healthier this year now that I only make vegan baked goods. You’re experience would be greatly appreciated in making these fearsome treats a little bit more wholesome. So glad you enjoyed it – happy weekend! Is there an oil-free recipe? …Also, what else is in the bowl with that yummy granola? Chia pudding? What’s the sauce on top? I dont know if oil-free would work or not. This granola is amazing!!!! Only question, mine didn’t clump up at all! You say at the end to break it apart into cluster, but for me, there was nothing to break apart. Any words of wisdom?? Thank you! Hey Melissa, Mine didn’t clump either when baked in the oven. My guess is that Lisa’s did more so in the dehydrator? Either way, enjoy! Oh my SWEET goodness!!!! I am making this as I type and my apartment smells amazing!!!! So much for candles! Once the smells disappears I will start another batch! haha I didn’t have any buckwheat groats on hand, so I just added more oats and some raw pumpkin seeds as well! This granola is SO DELICIOUS. I have made it several times already. I love it! The buckwheat in it adds such a great flavor too! love love love this granola. i tried this recipe and i loved it!!! it was soooo good!! I can’t stop eating this. Added chia seed, used brown rice syrup + honey instead of maple syrup, and OMG! Cashews are delicious in this recipe! It tastes like caramelized deliciousness. My husband no longer hates breakfast. Thank you! This came out SO good- served it with almond milk and nut butter- what an absolutely delicious way to kick off winter break! I have been wanting to make this forever and finally tried it last night. The flavor was great but it didn’t really stick together so we didn’t have any clumps. I think next time I will add a little bit more of the liquid glaze. Also, I will soak the dates first because mine were hard from being in the fridge (and probably from being a little old). Even my Blendtec had trouble liquefying them. Tonight I am trying the Butternut squash with kale and Parmesan! Can’t wait! Just one question: Can I substitute almonds or anything else for the walnuts? I’m allergic to walnuts and pecans :/ Or could I just leave it out? Yes Im sure that would be fine :) Enjoy! Do you think if I replaced the maple syrup with the brown rice syrup that the granola would cluster? And to Sara Blakey: I placed my dates in a 4 cup liquid measure with the coconut oil , maple syrup, etc and put it in the microwave for 30 sec. The heat kind of helped the ingredients come together-maybe it would help your dry dates moisten. And btw: if you haven’t made the butternut and kale yet….you will LOVE it! Try making extra topping too…so yum! Oh and I used my immersion blender for the wet ingredients. Perfect- if you have one. Thanks for sharing this recipe! I made it last night and have already devoured a good portion of it. So yummy. Question: how long would this stay good for, stored in a Bernardin jar? Hi Lisa, My granola has lasted up to 1 month in a glass jar on the counter. Enjoy! This is so stinking delicious, it’s ridiculous! I love the addition of the buckwheat–it adds a beautiful crunch to the finished product. I had to sub in pecans, as I’m out of walnuts. And, for some reason, I had to bake it 45 minutes to get it crunchy. But holy cow, this is addicting. What a fantastic recipe! Thank you so much! Is there something I can substitute for dates? I love the recipe but dates are so expensive and I’m really trying to budget my grocery bill. I just made this granola and wanted to compliment (and than you for!) the recipe; It is delicious. I am very much looking forward to the release of the cookbook.. I used raw millet in lieu of groats (I absentmindedly left the bag of groats in the bulk section) and it has a nice crunch. Cinnamon is my favorite flavor of all time. I just made this and it was amazing! I don’t think I’ll ever get store bought granola cereal again!!! You talk about delicious! This was too good not to sure. Thank you so much! Just made this to add as a topping on my acai and smoothie bowls. It’s so delicious! Do you dehydrate yours, it seems adding the raisins before baking would make them like rocks when it’s finished. I LOVE this granola! I order from a local vegan company and they use a similar recipe to this for theirs. I follow directions exactly but my granola never turns out crunchy.. it’s always soft. Any suggestions on why? yummy – doubled raisins, giving as christmas present to coworkers! Hi Angela! This granola tastes really good but is a little too sweet for me, what do you recommend I should do next time? use more coconut oil and less maple syrup? Hey Laura, Oh I’m sorry you found the granola too sweet. Yes I think more oil and less maple syrup would do the trick. This recipe is actually from a cookbook called “Tiny Treats”.